CONSTANT WATCH 14 was a nationwide communications exercise simulating tasking from FEMA to use the CAP HF network to pass coded message traffic from each of their 9 regional HQ. FEMA Region 9 HQ is in Oakland, so Oakland was the logical station choice. Major Wang and I from Sq188, plus Capt Gadd and 2Lt Thornton from Sq80, and 2Lt Alferov from Sq10 met at the Oakland squadron building around 7am. We loaded up equipment and supplies in CAP04114 and drove to the Martin Luther King Jr Shoreline Regional Park. 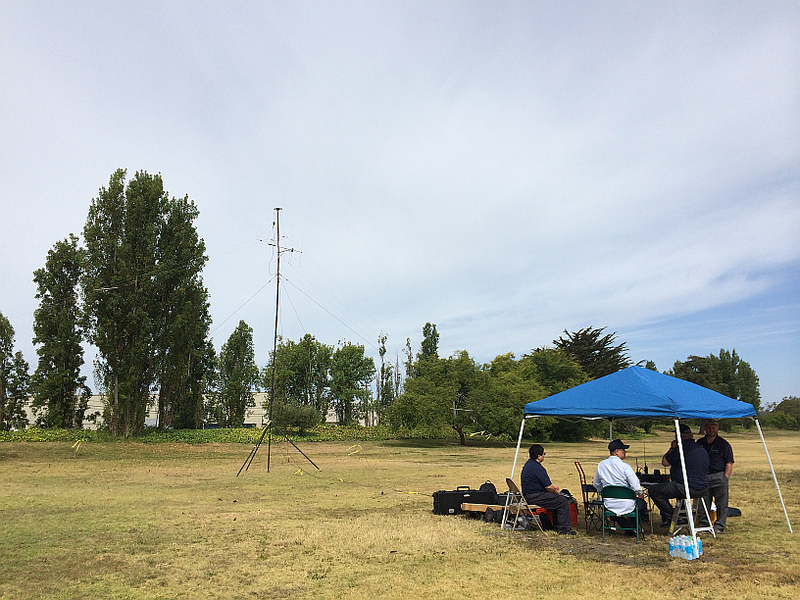 We set up a Field Station in the park and deployed both a 90' wideband HF antenna and a directional VHF antenna on a 30' mast. We began to make HF contacts using a CAWG RDP (portable HF radio) on emergency (battery) power. Meanwhile, CAP481 launched from KCCR with a portable repeater installed. We established comms with them and held their radio guard throughout their flight. CAP481 climbed to 7500' and orbited in grid SFO299, approximately 100 miles from the Oakland base. Mobile Radio Relay vehicle CAP04999 with a crew from Bakersfield drove to Harris Ranch and established their operating position about 80 miles southwest of CAP481. We established comms between Oakland and Harris Ranch via the airborne repeater, and passed message traffic. During the exercise, we were visited by CAWG/DC Maj Suter and were in contact with IC Maj Anthony. 2Lt Thornton completed some SQTR tasks for MRO, and 2Lt Alferov both renewed his MRO rating and completed the requirements for his Communications TECHNICIAN rating. On Sunday, due to reduced staffing, Maj Wang and I drove Concord's vehicle CAP04991 up to the top of Mt Diablo and deployed the HF radio, making contacts in neighboring states and regions and successfully completing passing the remaining traffic for the exercise. Major Wang completed the requirements for her Communications TECHNICIAN rating. Congrats, sounds like a great exercise and the view from Mt. Diablo must have been excellent!